Our boarding services are geared toward making both horses and people as happy as possible. We love animals and being outdoors, and so do the folks who board here. The horses live in spacious rolling pastures with plenty of fresh grass, shade, and spring water. Just grazing up and down the hills helps keep them fit, and the farm is surrounded by miles of beautiful and varied trail riding venues. 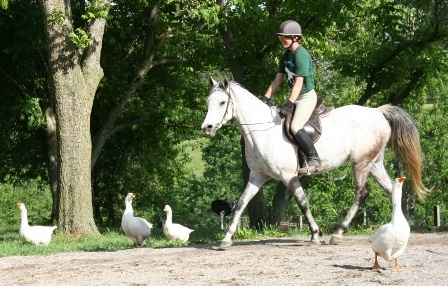 Susanna M. says: "I love boarding my horse here! The environment is very peaceful - I know my horse has never been happierÂ Elaine and the Harley Farm team do a great job ensuring that all the animals are well cared for, and I love knowing that there is always someone there to keep an eye on things. The facility is safe and beautiful with access to great ride out, too. I you have any potential boarders that would like to speak w me directly, feel free to give them my phone number and I will tell them what awesome care you guys take of Faran!!" Our friendly, laid-back boarders can enjoy the farm's quiet beauty whenever they wish. Located on 42 rolling acres, Harley Farm features a 150-year-old bank barn, open fields, woods, and a shady stream. Pasture boarding (free-access pasture, hay, and water) is $250 per month; the rate for additional horses is $200 per month. We offer a range of additional services, such as medical treatment, graining, and blanketing at reasonable rates.